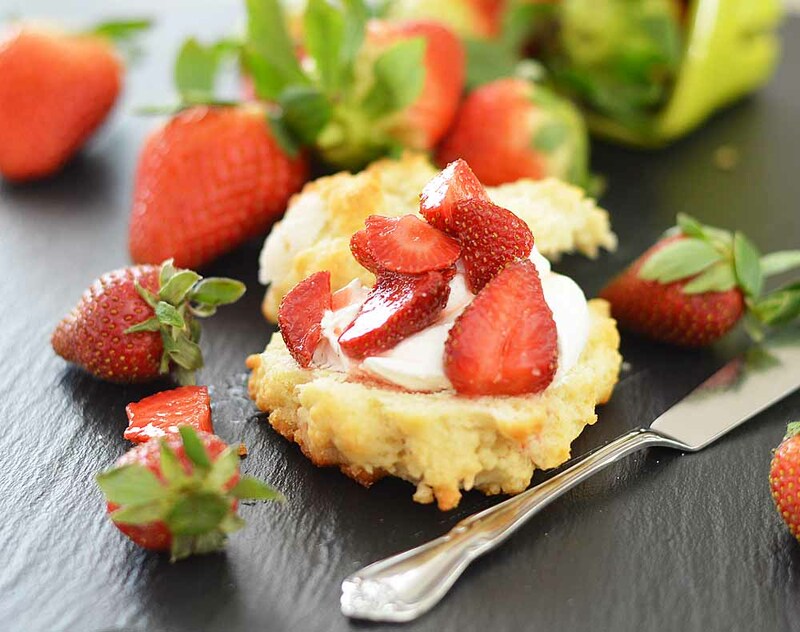 These little Vegan Strawberry Shortcakes are so incredibly yummy and really easy to make! My mom is a HUGE lover of strawberry shortcake, so this recipe was for her. 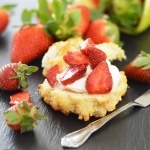 They are served with a dollop of coconut whipped cream and fresh sliced strawberries that have been macerated with sugar until they form a syrup, and are absolutely delicious. 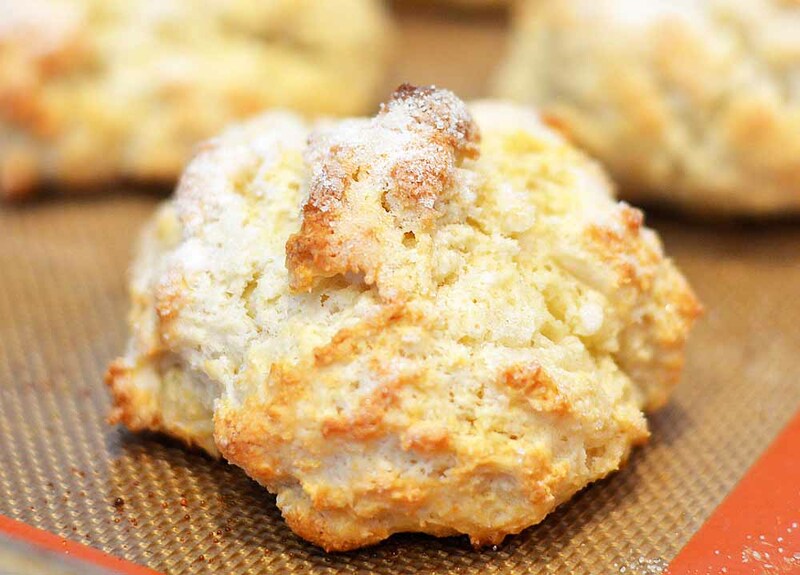 Flour, baking powder, baking soda, a pinch of salt, sugar, vegan margarine and vegan sour cream (or coconut milk) are all that is needed for a super light and flaky biscuit. The dough is quite sticky when you scoop it, so don’t panic. In fact, like most biscuits, the less you handle them the better! I use a large ice cream scoop to evenly divide the dough. This recipe makes 8 large biscuits. You want to keep them high so that there is room to slice horizontally for serving. Just before baking, I like to lightly brush the tops with almond milk and give them a generous sprinkling of sugar. This makes for a nice, crispy exterior and a very tender interior. We are looking for a light golden brown color here. Allow to cool slightly before slicing. If you are lucky, you will find these massive strawberries in your local grocery store for under a dollar when in season. I save the small, aesthetically pleasing ones for serving and slice the rest to toss with sugar. Allow the sliced strawberries to sit in the refrigerator for at least 20 minutes so that it forms a nice, thickened syrup. All that’s left to do is slice those biscuits in half, top with the sliced strawberries and a dollop of coconut whipped cream. A cup of hot tea is my mom’s favorite beverage with these little beauties. If you’d like to see how I make coconut whipped cream, you can click here for the recipe. 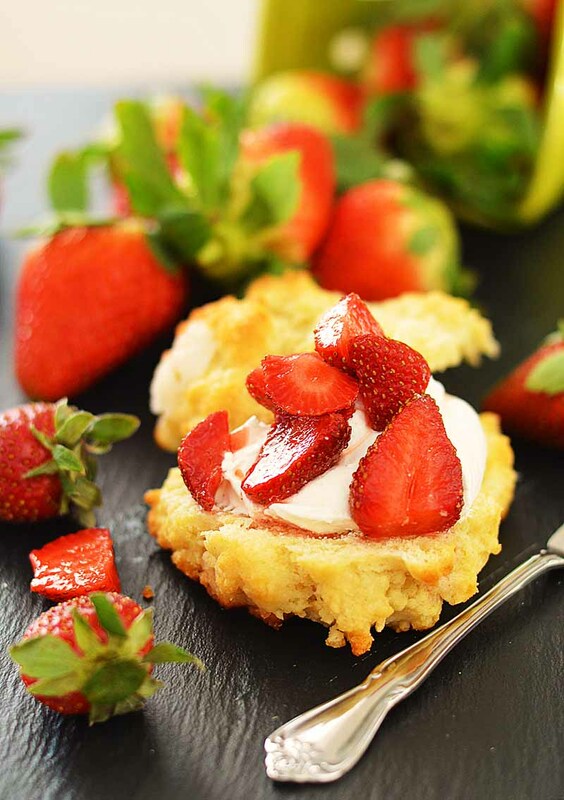 Did you make this Vegan Strawberry Shortcake Recipe? If so, leave me a comment below and let me know what you thought. Line a baking sheet with either parchment or a silicone baking mat. 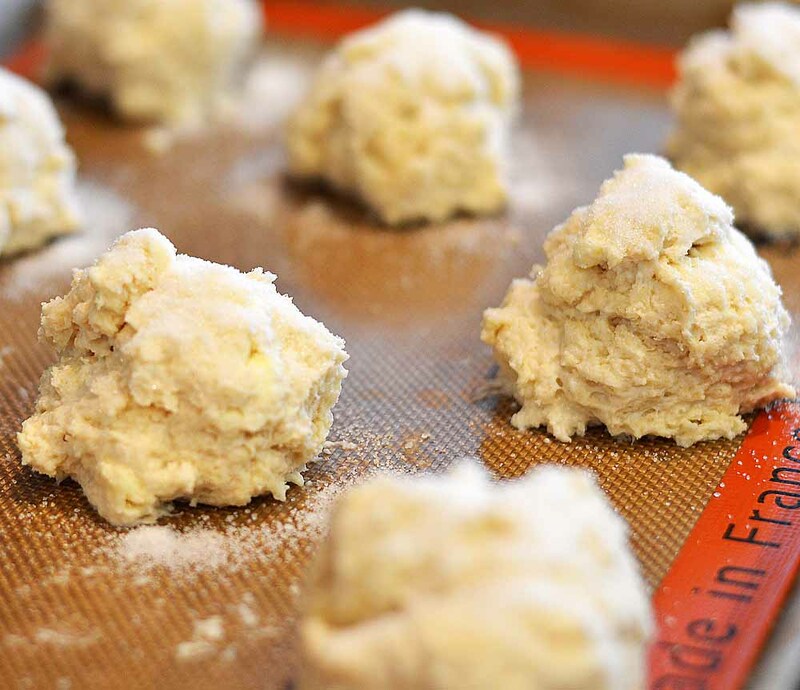 In a medium bowl, sift the flour, baking powder, baking soda and salt. Stir in sugar. Cut the butter in with a pastry blender or two knives until it resembles a coarse meal. Stir in vegan sour cream and almond milk. Scoop the batter into high mounds on a baking sheet. Brush the tops with almond milk and generously sprinkle with sugar. Meanwhile, in a small bowl, add the sliced strawberries and sugar. Stir well to combine and chill until ready to serve. The juices will thicken into a syrup. Make the coconut whipped cream (recipe link in the blog post). Cool slightly before serving with the sliced strawberries and coconut whipped cream.